Photographing artwork, whether the piece is a painting or a sculpture or made from some other medium, poses some interesting challenges for the photographer. As with any subject photographed, artwork needs to present an image that can convey to the viewer the nuances that make it unique. Assuming the photographer plans to take high-quality photos of artwork, the first thing on the agenda is acquiring professional-level equipment. Point-and-shoot cameras have become much better in the digital age, but still do not touch the quality of single-lens reflex cameras. Two forms of these SLRs exist: the 35mm-style camera and the medium-format camera. There are film and digital versions of both, but the 35mm-style camera costs considerably less, as do the lenses and accessories. Other equipment, if the plan is to photograph a lot of artwork, would include professional-level light stands with diffusers.The photographer also should always use the highest-quality settings on a digital SLR. Use the RAW format, never JPEG. Set the megapixels to maximum as well. Fewer exposures will be available per memory card this way, but the quality will be superior to shooting at lesser resolutions. 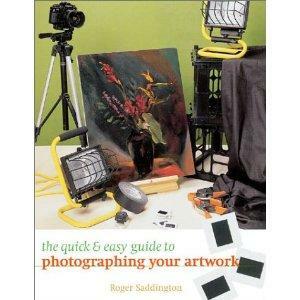 The first consideration the photographer must have when photographing artwork is for how the artwork will be lit. If you have ever held a camera up to a painting and clicked the shutter, you know that once the flash goes off, the painting may be obscured by the glare or may lose its depth. Shadow and light work together to give any object depth, even a painting. Therefore, pointing and clicking generally will not work to photograph a piece of art. The first thing to try to get the piece of artwork lit is a diffuser, usually with a bounce flash. A [[How_to_Take_a_Photo_With_a_Soft_Appearance]|diffuser]] is a type of filter that fits over the flash to diffuse or soften the light. The diffuser can spread out the light, preventing the direct bounce-back of an electronic flash off the surface of the artwork. The next thing to try is to bounce the flash off the ceiling or a nearby wall. This creates indirect lighting that can give enough illumination for capturing the image without making it wash out from a direct strobe. For a piece of sculpture, the diffuser usually works, too, because in most cases a direct, unfiltered flash will produce shadows that are too harsh. Shadows help define the artwork for the viewer, but if they appear too sharp it can give a different feeling to the image. If there is enough time to set up a proper shoot, the photographer can use professional lighting on stands, including diffusers. Putting these lights on either side of a painting at a slight angle, for example, can provide sufficient light for the image. This method of lighting artwork also will give a more balanced and smoother form of lighting for the final image. A light box will come in very handy if the artwork, particularly sculptures, is tiny. For example, shooting an image of small figurines can be tough if it is done on a pedestal in a gallery, especially if it is covered by glass. To get good images of these, use a light box. This, essentially, is a cube with the front and top open, and white or off-white bottom, sides and back. Light stands to either side can be moved to create the ideal lighting for the artwork. Again, using a diffuser can help prevent dense shadows where they are not needed. Some art galleries and museums will not allow flash photography while photographing artwork, so the photographer may need to shoot in existing light. The key to this form of photography is to use a tripod. No matter how well-lit an area looks, existing light can actually be low. This will make the shutter stay open longer to capture the image, and any motion in the hands of the photographer can cause the camera to record a blurred image. Affixing the camera to a tripod will allow for a steadier shooting platform. To minimize camera motion further, the photographer should use a shutter release cable for older film cameras or a remote shutter trigger for newer cameras. Specifically for close-ups while photographing artwork, a macro lens will help get details. Using the light box, for example, to capture images of small items usually will require a macro lens. This kind of lens goes beyond the normal range of focus. The average lens will focus down to approximately a foot, but a macro lens can get within an inch or two of the artwork to focus precisely on the facets of the piece. This can help if the photographer is looking for unusual or experimental compositions. Whenever possible, it is important to remove glass or plastic that may come between the lens and the art object. Such reflective surfaces can cause significant problems with lighting, whether the photographer uses a flash or not. Glass, even without a flash, can put the photographer's reflection in the middle of the artwork, which will make the image unusable. With the right tools and techniques, you can make your photography of art into a masterpiece unto itself. Remember to plan your sessions and use appropriate lighting to avoid the glare that often shows up in photos that are just snapped without any forethought.